Are you as excited as we are about the new Live Action Beauty and the Beast Disney film coming? We have been waiting since they announced it around 1 1/2 years ago (or maybe longer)! We loved Cinderella and I am sure Beauty and the Beast live action will be just as wonderful. The new trailers coming out are just exquisite and very true to the animated version… this makes the little girl in me happy for sure! 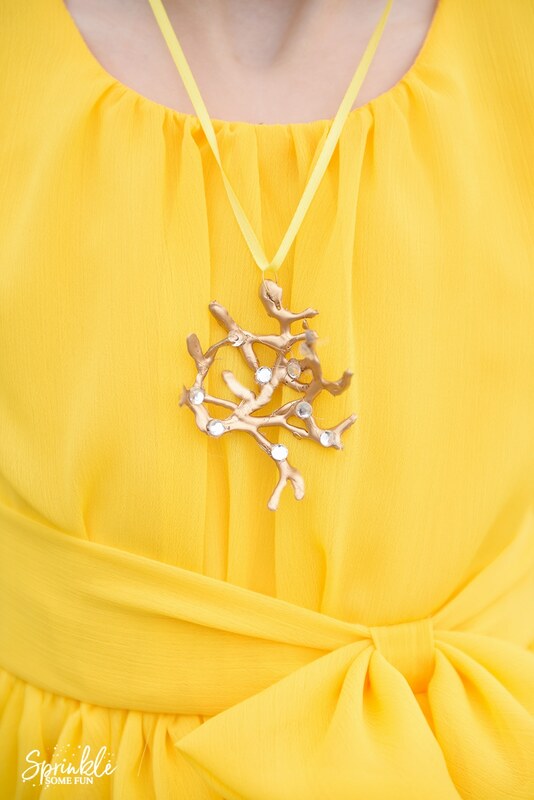 We noticed that in the new movie, Belle is wearing a beautiful gold rose tree necklace in the ballroom scene. I’m not sure what significance (if any) it plays in the movie, but she is wearing it a couple of times. 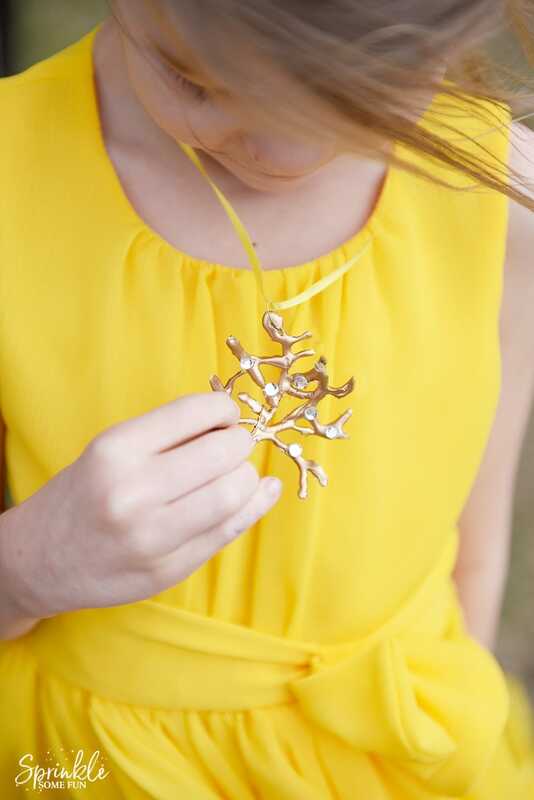 DIY Beauty and the Beast Rose Tree Necklace is just like the one Belle wears in the live action film! Make it easy with a glue gun, spray paint and some rhinestones! This is perfect for a Beauty and the Beast themed party because you can make several of these for party favors. We have three girls and this saves us a lot of money compared to buying three necklaces… plus it’s fun to make! There will be many more tutorials and even some party ideas coming up soon. This post contains affiliate links which support the maintenance of this site. My littlest girl wanted to have a dress similar to Belle’s in the movie. 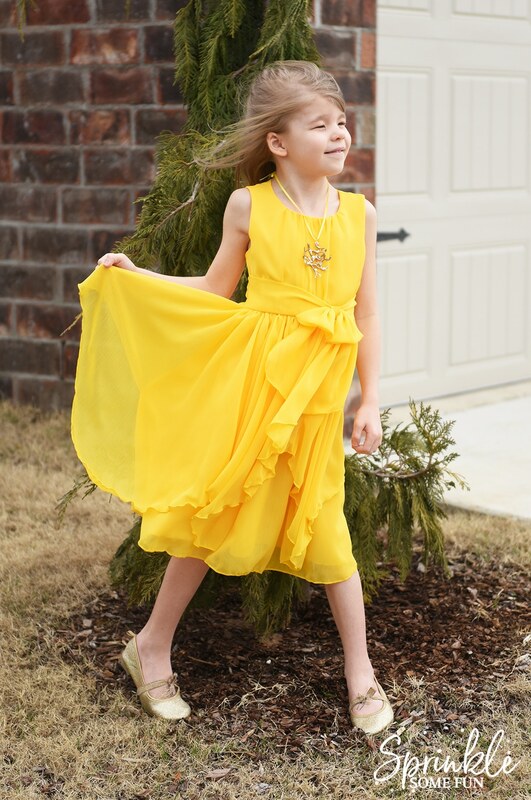 We found an affordable option on Amazon with this yellow Organza dress (affiliate). It also makes a nice dress for Easter or a church outfit too! The little gold shoes we found at Walmart around 4 months ago. Here is a similar pair of gold glitter shoes (affiliate). I made this quick video instead of trying to type out the instructions here… so watch below to find out how to make your own necklace! 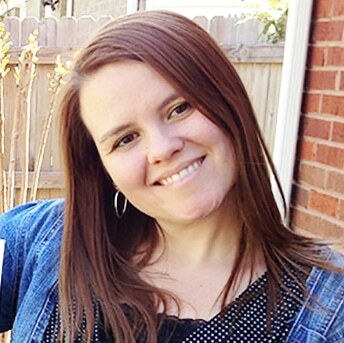 This diy Beauty and the Beast Rose Tree Necklace turned out so pretty and because of the wire it is bendable… which looks just like the Beauty and the Beast live action version. 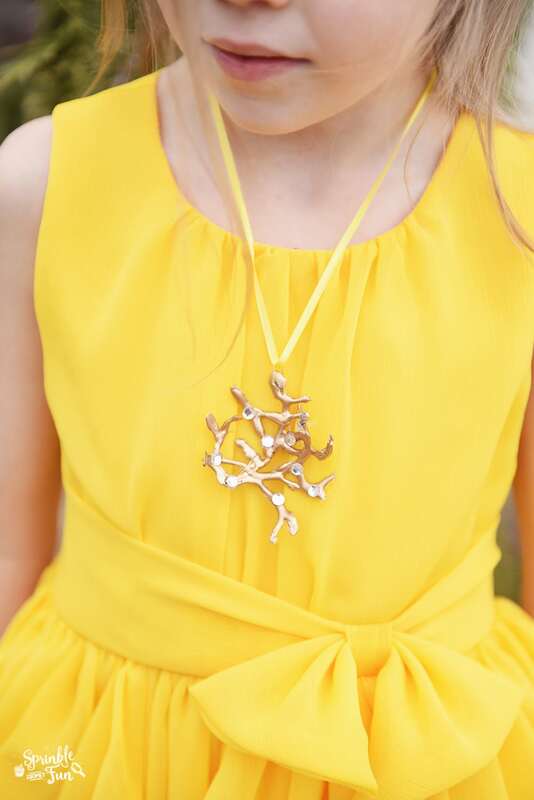 My girls will be wearing their diy Beauty and the Beast Rose Tree Necklace the day we go to see the movie! We have some other affordable cosplay tutorials and outfit ideas coming soon… so stay tuned for more!